Coprinus kuehneri Uljé & Bas in Persoonia 13: 438. 1988. Coprinus plicatilis var. microsporus Kühner in Bull. trimest. Soc. mycol. Fr. 50: 57. 1934. Sel. icon. - Bender, APN-Mitt.Bl. 7(1): 40. 1989; Donelli & Simonini, Boll. Grup. micol. G. Bres. 29: 116. 1986 (as C. leiocephalus P.D. Orton). Sel. descr. & fig. - Bender, APN-Mitt.Bl. 7(1): 38. 1989; Donelli & Simonini, Boll. Grup. micol. G. Bres. 29: 115. 1986 (as C. leiocephalus P.D. Orton). Vern. name - Kleinsporig plooirokje. Pileus 5-25 x 3-15 mm when still closed, 15-40 mm wide when expanded, ellipsoid or ovoid, expanding to paraboloid or convex, rarely becoming flat, sulcate-striate up to centre, at first rather dark red-brown, less frequently orange- or yellow-brown, later with greyish tinges (at centre Mu. 2.5 YR 2.5/2-4, 3/2-4; 5 YR 3/2-4; 7.5 YR 3/2-4, 4/4, 5/4; 10 YR 7/4; at margin Mu. 5 YR 4/4-8, 5/4; 7.5 YR 4/2-6, 5/4, 6/5; 10 YR 4/1-3, 5/2-3, 6/2-3, 7/3-4; K.& W. 7F7, 8F4, 7E/F5, 8E/F4, 7F5, 6E6, 6E/F7, 6D4, 6C6, 5C4). Lamellae, L = 32-50, l = 1-3, free, remote from stipe, first whitish, then grey-brown (Mu. 10 YR 5/3, 6/3-4), finally blackish grey. Stipe up to 100 x 1-3 mm, base clavate, sordid white to sordid yellowish brown. Spores 6.6-10.8 x 5.5-8.2 x 5.1-6.0 µm, Q = 1.05-1.60, av. Q = 1.15-1.45, av. L = 7.9-9.9, av. B = 6.3-7.7 µm, heart-shaped, tending to rhomboid or mitriform, triangular, rarely 4-5-angular, lentiform, with eccentric germ pore and conical or convex at base and rounded at apex, medium to dark red-brown. Basidia 19-38 x 8-12 µm, 4-spored, surrounded by (3-)4-6 pseudoparaphyses. Pleurocystidia 50-100 x 18-36 µm, subcylindric or utriform with 21-32 µm wide neck or rarely almost exclusively globose. Cheilocystidia 25-80 x 10-30 µm, if with neck then 11-23 µm wide, subcylindric, ellipsoid, (sub)globose, utriform or (sometimes) sublageniform. Pileipellis smooth, hymeniform, made up of spheropedunculate cells up to 100 x 28 µm. Clamp-connections present. Usually terrestrial on naked soil under trees or shrub, more rarely at grassy places. Solitary or -less frequent - a few together in small groups. Rather common in the Netherlands. Recorded certainty from Germany but probably rather common all over Europe and other parts of the world. 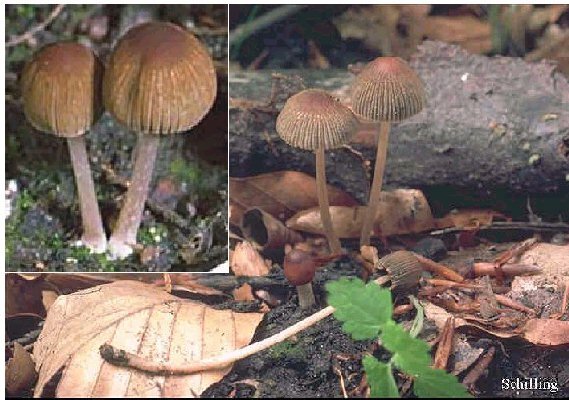 Macroscopically C. kuehneri can usually be distinguished from its closest relative C. leiocephalus by the dark red-brown colour of the pileus, which is paler and yellow-brown in the latter. Microscopically C. kuehneri is characterized by the narrower, triangular spores with a tendency to being rhomboid or mitriform and the more cylindrical cheilocystidia. 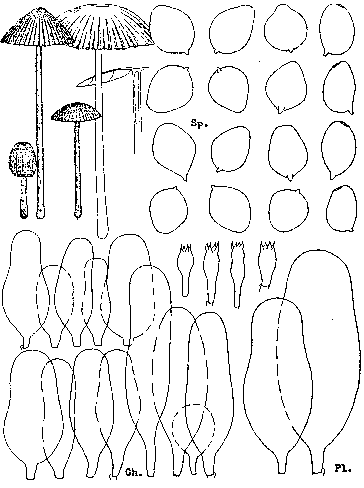 In collections of C. kuehneri in which the cheilocystidia are predominantly lageniform, these cells have a broader upper part than those of C. leiocephalus.